The Evergreen Lodge in Yostemite is a great value for money, compared to other lodgings of similar quality outside the Yosemite Valley and it's less expensive (and nicer) than the hotels inside the park. If you need constant cell phone contact, fast WiFi or a TV fix, this place is not for you. GPS navigation and online map sites can be wrong about Evergreen Lodge and mobile phone service will stop before you get there. For accurate directions, check your confirmation email or a paper map. Rooms: One- and two-bedroom cabins and cottages. Five cabins are fully ADA accessible. Parking spaces are located as close to the cabins as feasible, but you may have to walk a bit to get to your front door. They also offer a custom camping option, providing a fully=set-up tent and bedding, ready for you to step into and sleep. Amenities: No televisions in rooms, but they do have satellite radio with iPod audio connectors. Coin-operated laundry. Cabins have small refrigerators and Keurig coffee makers but are not set up for cooking. Internet access only in the recreation center, but with limited speed and bandwidth. Activities: Swimming pool and hot tub. Kids' activities, movies and nature talks (some days). The evening "happy hour" at Evergreen Lodge serves S'Mores around the campfire. Massage and guided hikes (for an extra fee). Pet Policy: Pets are not allowed, but service animals are. 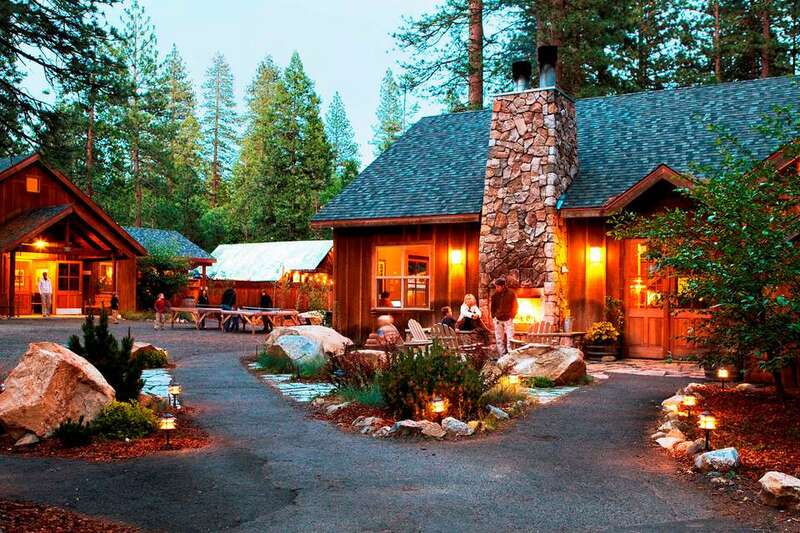 Evergreen Lodge is our favorite place to stay when visiting Yosemite, providing good value for money that more than offsets its distance from Yosemite Valley. The oldest parts of Evergreen Lodge were built in the 1920s, giving it a charming, old-fashioned feel, but most of the lodging is in ewer cabins and cottages. The older "vintage" cottages have been extensively renovated inside to match the look of the newest ones. And all of them are done in a smart, clean, style. Housekeeping is spotless. It all adds up to a make this a relaxing place to stay, in the woods with plenty of modern amenities. In fact, there's some danger that you may like the Evergreen Lodge so much that you won't want to leave it, but if you're mostly looking for a quiet, away-from-it-all experience, that could be a good thing. Add a massage, a swim, or a guided hike and you'll be rejuvenated in no time. Take time to walk around the property and you'll find lots of hidden, fun things like a giant spider web made of ropes, a sleepy hammock or a fort made from tree trunks. And make sure you find the sunset deck at the appropriate time as it has a great view. The best way to be happy at Evergreen Lodge is to know what to expect. Just because the place has cabins doesn't mean that you'll be able to cook in them. Rooms have refrigerators, but no kitchens. It's 5.5 miles off the main road (a 15-minute drive), which is one reason it's so quiet, but that's far enough that once you get there, you probably won't want to go somewhere else for a meal. Don't let that be a worry. Their on-site restaurant serves an innovative menu featuring locally-grown produce and including some very interesting-sounding vegetarian dishes. Because of its remote location, Evergreen Lodge depends on satellite-based Internet access, which is slow, and it's only available in public areas. Don't plan to download a movie, watch that streaming video or email a bunch of photos to your friends. Some folks might assign negative points for this, but we find it refreshing to be in a place where all our modern gizmos can't distract us. Cell phones are unlikely to work at Evergreen Lodge, either. They offer free calls to anywhere within the United States so you can still phone home, with only a few phones available for this in public areas. As is common in the travel industry, the writer was provided with complimentary services for review of Evergreen Lodge. While it has not influenced this review, About.com believes in full disclosure of all potential conflicts of interest.